I was born in Wuhan, China, and I am now living in Beijing. How (and when) did you start playing Go? I started playing Go when I was 7 years old. At the beginning I learned from several amateur teachers, and from some professional teachers one year later. Can you tell us a bit about the Go culture in China? Go originated in China, and it is said that the history of this game has more than 4000 years. Nowadays, many parents are willing to send their children to a Go school to cultivate logical thinking (I think Go is a good choice for children as a hobby). But because of the fierce competition, if one wants to become pro, he/she has to study at a Go school, giving up normal education (quite hard). Go is more like a sport than a culture in China today. Did you stay at a Go Institute to study and become a professional? How did you train yourself to reach such a high level? Yes, I studied at a local Go institute in Wuhan. At that time, about ten children had close strength and similar age with me, and also several experienced pro teachers taught in Wuhan, so there was a good environment for us to study Go. Both serious training games and advice from teachers are the most important factors, and of course, self-studying is the basis. How was it like passing the pro-exam? Please describe your experience! It is really hard to pass the pro-exam. There were many strong children, and only about 20 can pass each year, so I failed at first three times. When I almost lost hope, finally goddess of fortune helped me to pass in the fourth time. Have you beaten any famous professional player in the past? And what was your most memorable game? I have beaten several players who are in the teams of the Chinese Top Go League now, but at that moment they were not that strong. My most memorable game is the decisive game which I won to pass the pro-exam. In that game I was behind a little after middle game but I caught up in yose, and finally only won by 0.5 point. Where did you learn about KGS and what is your impression of the server? I learned about KGS from my friends MilanMilan [Liu Yuanbo, 2p] and Finnish8d [Jeff Chang] in 2008. My impression of KGS is that the user interface looks simple and very convenient to use, and it is the most international Go server. Yes, I liked Doraemon very much when I was a child. Another reason is that I'm interested in Go program development. I think it is a challenging and meaningful work. But I feel sorry that I haven't spent any time studying Go programming. Who do you think is currently the strongest player on KGS? No one has the absolute strength to be the strongest one (among active 9ds). Are you accepting online Go students? 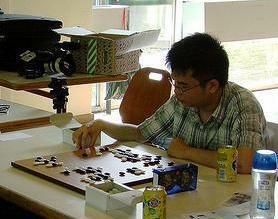 And will you be teaching Go again in the next editions of 'Experience Go in China'? About six months ago you participated in the Pandanet Go European Cup (Paris Finals) and took 3rd place (only behind your Chinese teammates). Are you planning to participate in more European Go Tournaments in the future? If I have the chance and time, I would like to. There are many kids in Europe (and the USA) who aspire to reach pro-level, but who later find it hard or impossible to actually achieve that goal. Suppose one of them is reading these lines right now: what advice would you give to him/her? I think the biggest limitation for kids in Europe and the USA is that they don't have proper opponents, and the lack of teaching resources is another problem. I hope an official organization (e.g. EGF) can gather promising kids together to play league games online regularly, and invite several teachers to discuss games or variations with them. A standard question: how many handicap stones do you think you would need to beat God? Lee Sedol's answer is 4, so I think I need 5 or 6. Perhaps a harder question: what attracts you in Go? Go is a strategy game. If chess is like a battle, then Go is like war. Go includes more philosophy ideas. I'm a graduate student at the Peking University now, so my current work is studying. Who is your favorite Go player? Wu Qingyuan [Go Seigen] and Lee Changho. They both changed the trend of Go theory. Risk aversion. I like peace more than fighting. noth1ng: If one is looking for a teacher how he should decide which teacher to choose? I think we'd better learn from different style teachers, so that we can get different ideas. It can help us to avoid extreme style. We can't say whether simple playing style is good or bad. Everyone has strengths and weaknesses. What we need to do is make up for weaknesses. In my experience, most western players are not good at fighting; if you are in this group, you can try to play more actively. If you're good at fighting, but always get punished due to your overplays, you need to consider playing more solidly. davy014: Are professional activities enough to your future or do you plan to quit professional go world ? In other word, could you live decently just with your go stuffs? I haven't professionally studied Go since 2004. I think I can live, but not decently, just with my Go stuffs. breakfast: 1) It's hard to find your name in recent Chinese Pro tournaments. Do you attend them? 2) What is, in your opinion, the difference between your level and level of top Chinese pros like Gu Li or Kong Jie? 3) Is it common to use Go databases (with old games) in China, or are they still replaying games from books? 1) No, I didn't attend any recent Chinese Pro tournament. 2) The difference between my level and top pros' depends on how we define it. They can't give me 2 handicap stones, but even if I keep studying Go, I probably can never reach their level. 3) It is very common to use Go databases (at least for me) in China, we can get old games from http://weiqi.sports.tom.com/, but it is a Chinese website. Go19x19: How should we structure our study (many tsumego, more fuseki, joseki, etc)? Thanks. Nation: Would you be willing to play a simultaneous game against some of the amateurs? I don't often play simultaneous games publicly. kenny: What do you think of Antti ['Tien' on KGS] becoming an insei in Japan? I think it will be a good experience for Antti. I hope he can achieve his goal. Bobby: In your opinion who is the strongest player in Europe? I'm not quite familiar with European players. I learned their strength mainly from KGS. I think both Catalin and Ilya are outstanding, and Artem is promising. lipo: Do you still study Go? and if yes, how long do you spend studying? No. I spend most of my time on school work instead of studying Go. I feel like yose is more important than joseki because in these levels it is not so important to know the joseki well; a book once said that it's better to play a good result without perfect shape then to play a joseki that doesn't help you at all in the global position. What's a good way to improve yose skill? Does it come strictly down to reading ability acquired from doing a lot of tsumego problems? Yes, it is, especially in slow game. Does it mean replaying pro games is totally useless until one reaches 5 dan?